Richard Plantagenet was the only son of Richard of Conisburgh, Earl of Cambridge, himself the second son of Edmund of Langley, Duke of York and Isabella of Castille, Edmund of Langley was the fourth surviving son of King Edward III. Richard's mother was Anne Mortimer, sister to Richard II's heir, Roger Mortimer, Earl of March who after his death became the premier descendant of Lionel of Antwerp, Duke of Clarence, Edward's second surviving son. By the strict laws of primogeniture, this made Richard the heir of Edward III, giving him a slightly better claim to the throne than Henry VI, who descended from Edward's third son. Richard was born on 21st September, 1411, his mother died giving birth. He had an elder sister, Isabel, who was later to become Countess of Essex. When he was but four years old his father was executed by Henry V on 5th August, 1415, for his part in a plot to place his brother-in-law Roger Mortimer on the throne. 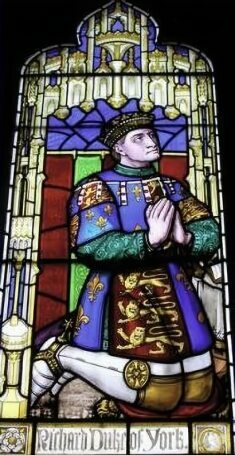 On the death of his paternal uncle, Edward, Duke of York at the Battle of Agincourt, a large man who was reported to have smothered in his own armour on the battlefield, Richard succeeded to his vast estates and the title of Duke of York. His wardship was granted to Ralph Neville, Earl of Westmorland, who in 1424 betrothed Richard, then aged thirteen, to his nine year old daughter and eighteenth child, Cecily Neville. York lead an expedition to France in 1436, where he acquitted himself ably, returning to England in 1439. He was appointed Lieutenant of France in 1440. Taking on the role previously occupied by John, Duke of Bedford, the brother of Henry V. His wife Cecily, known as the Rose of Raby, accompanied him and three of his children Edward, Edmund and Elizabeth were born there. In 1443, John Beaufort, Duke of Somerset, grandson of John of Gaunt's illicit union with Katherine Swynford, was sent to France to relieve Gascony, leading to much ill feeling on York's part, who was denied resources required to maintain the borders of Normandy. Somerset's mission was a failure and he died on his return to England in disgrace, possibly he committed suicide. A peace was negotiated with the French and York returned to England for a second time in 1445 and firmly attached himself to the pro war party headed by the king's uncle, Humphrey, Duke of Gloucester in opposition to the policies of Cardinal Henry Beaufort. The lieutenancy of France was given to Somerset's younger brother and successor, Edmund Beaufort, 2nd Earl of Somerset, which no doubt exacerbated York's resentment of the Beaufort family. The death of Humphrey Duke of Gloucester in 1447, made Richard of York the first Prince of the Blood. In 1448 he was appointed Lord Lieutenant of Ireland, a convenient means of keeping him out of the country. In 1450 rebellion broke out against King Henry VI's rule in Kent and Sussex, led by one Jack Cade who used the name Mortimer, the use of the names of Mortimer and York, underlined the trend of popular opinion. The rebels took London and killed Henry's Lord Treasurer, John Fiennes, Baron Saye and Sele. York landed at Beaumaris on Anglesey and resisting attempts to waylay him, he marched on London and whilst insisting his loyalty to the king, demanded better government and that those responsible for the loss of Normandy, which had recently fallen to the French, face punishment. Parliament elected York's chamberlain, Sir William Oldhall, as speaker and Somerset was placed in the Tower for his own protection. In 1452, York advanced on London from Ludlow and demanded recognition as the heir of Henry VI, he laid before the king a bill of accusation against Somerset, at the same time swearing fealty to the king, and promising for the future to sue for remedy in legal form. At a meeting at Dartford, a temporary agreement was reached. 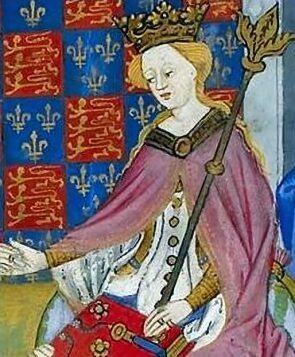 After years of a barren marriage to the king, Margaret of Anjou announced herself pregnant in 1453, a crushing blow to York's hopes. In August, 1453 at the age of 32, Henry VI began to exhibit signs of serious mental illness. By means of a "sudden fright" he entered into a trance-like state reacting to and recognising no-one. Catatonic schizophrenia or depressive stupor have been suggested as a likely diagnosis. This was probably an inheritance from his grandfather, Charles VI of France, who himself suffered from bouts of schizophrenia. York was appointed protector, to the annoyance of the Queen, who strongly felt that she and her party should govern England. Two months later, Queen Margaret (pictured below left) gave birth to a son, Edward of Lancaster. Rumours abounded, fed by the Yorkists, that the child was not the feeble minded King's but Somerset's, all of which threw more fuel on the fires of discontent. The Queen, 'a strong laboured woman', was fiercely protective of her son and his rights. Henry eventually recovered his senses and when showed his son, declared himself pleased and enquired about the Child's godfathers. Adding to existing doubts about the child's paternity, he declared that Edward must have been fathered by the Holy Ghost. York, dismissed from office, was discontented. His position, he realised, was now a precarious one, exposed as he was to the suspicion and venom of the Queen, who once again controlled the government. Somerset was restored to favour and York deprived of the Captaincy of Calais. York, his brother-in-law and supporter Richard Neville, Earl of Salisbury and his nephew Richard Neville, Earl of Warwick gathered an army. The king and Somerset met the combined Yorkist forces at the First Battle of St. Albans on 22nd May 1455. Margaret's favourite and York's hated rival, Edmund Beaufort, Duke of Somerset was killed during the battle and Henry, who had been wounded by an arrow was captured and returned to London by the victorious Yorkists. York was again appointed Protector of England. Margaret, true to character, was not going to accept this meekly. She gathered an army to advance her son's cause and York, Salisbury and Warwick were forced into flight before her. The rebel lords gathered support and in retaliation took London. Warwick met the forces loyal to the king at the Battle of Northampton, defeated them, and took the unfortunate Henry captive back to London. York returned from exile and laid formal claim to the throne. When asked why he had not previously done so, he responded that "though right for a time lies silent, yet it rotteth not, nor shall it perish." A compromise was agreed on, whereupon Henry VI was to keep the throne for the rest of his lifetime but the succession was to go to York and his heirs. No one for a moment expected that the spirited Margaret would accept the disinheriting of her son and this proved to be the case. Margaret of Anjou attempted to gain the support of James III, King of of Scots, York and Salisbury headed north to meet the threat, arriving at Sandall Castle, a few miles to the south of Wakefield on 21 December, where they intended to spend the Christmas season. The Lancastrian forces which had regrouped under the leadership of Somerset and the Earl of Northumberland advanced on them. Instead of awaiting reinforcements, York led an impulsive charge on the Lancastrians. Two large forces of the Lancastrian army, commanded by the Earl of Wiltshire and Lord Roos, emerged from nearby woods and the jaws of the trap snapped shut on the Yorkist leader. The Duke of York was killed in the ensuing slaughter known as the Battle of Wakefield, as was his seventeen year old son, Edmund, Earl of Rutland, who was killed whilst fleeing the battlefield over Wakefield Bridge, his pleas for his life being ignored. Salisbury was captured during the battle and conveyed to Pontefract Castle where he was executed. The Queen had their heads impaled on spikes on the city walls of York, York's wearing a paper crown in derision. Two of York's sons were later to rule England as Edward IV and Richard III. 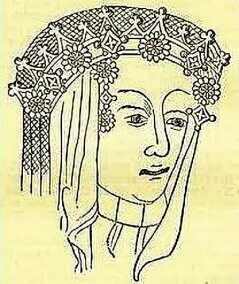 His widow, Cecily Neville, survived both, living on to see the reign of the first Tudor King, Henry VII, who married her granddaughter, Elizabeth of York. She died in 1495, 35 years after her husband and was buried with him at Fotheringhay Church, Northamptonshire.